Nathalie, Marc, Graeme of Scottish Avalanche Information Service (SAIS) and Laurent below the site of the incident. 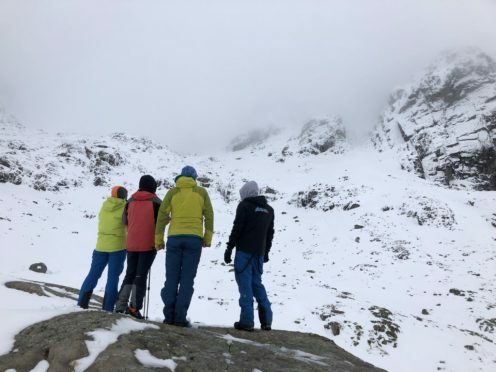 Swiss national Mathieu Biselx was climbing the UK’s highest peak when a wave of snow swept him and his friends down the mountain. He was reunited with family and friends on Friday after being discharged from Belford Hospital in Fort William. He was interviewed by local media and pictured with his family, including his wife and year-old daughter, in his apartment overlooking the valley of the Rhone. In a tribute to his fellow climbers, who have only been named as Cedric, Raph and Adrien, Mr Biselx said: “Thank you for your friendship. Have a nice trip to your new mountains. Yesterday, Lochaber Mountain Rescue Team, alongside the Scottish Avalanche Information Service, assisted in the request of a brother and sister of one of the casualties who perished on Number Five Gully, by taking them to the scene of the accident to report back to family and friends in France and Switzerland a clearer picture of what occurred last Tuesday. An appeal has also been launched by LMRT for any equipment found on the peak to be handed into the police station in Fort William or to the LMRT base, to be repatriated to the men’s families. A spokesman added: “This equipment is symbolically very important for the families and, if you do happen to be in area, please have a look and it would be very much appreciated if they could be found and returned.